There is an endless selection of down jackets on the market these days which typically fall into the ultra-light or the alpine category. 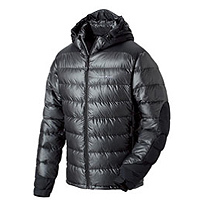 The new trend seems to be what I like to call a 'mid-puffy', something that has slightly more down loft than an ultra-light but not one that is so warm and heavy you rarely need it unless your in the midst of a deep freeze. This is where the Mont-bell Frost Smoke Down Parka comes into the story. It's a Down Parka that is a 'mid puffy' with some nice extras that make it more durable while not adding much overall weight. 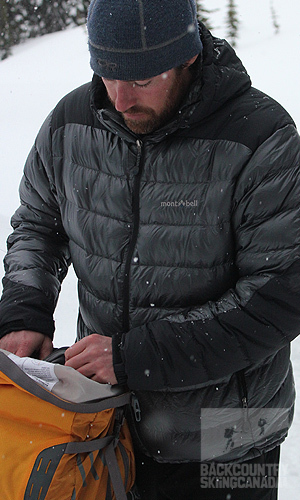 The Mont-bell Frost Smoke Down Parka uses 800 fill down insulation which is a step up from the typical 600 down fill that most ultra-lights down jackets utilize. 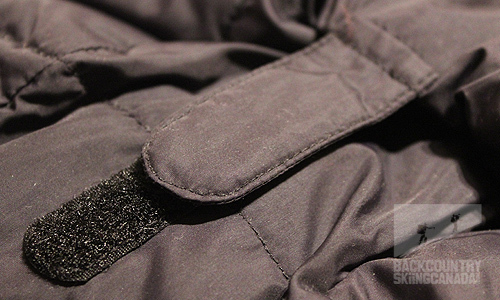 The exterior fabric is a mix of 15-denier nylon (which Mont-Bell calls 'Ballistic Airlight' more on this later) and 40-denier nylon on the cuff, shoulders and hood to increase wear and moisture repellency where it is needed most. The Frost Smoke Down jacket uses sewn-through construction which is not as warm as box construction but it does help keep costs down as well as overall weight. Both good items to reduce in my book. Fill: 800 fill power goose down, Fill Weight of 3.5 oz. Zipper garage and hood adjustments. 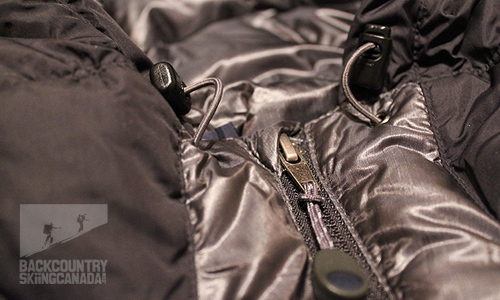 15-denier Ballistic Airlight nylon shell & 40-denier nylon reinforcement. Velcro cuffs with 40-denier nylon reinforcement. Comfy-cozy hood with 40-denier nylon reinforcement. Ballistic nylon sounds pretty 'bullet-proof' (excuse the pun). It's one and a half times more abrasion resistant than similar weight fabrics and three times more tear resistant compared to nylons 20% heavier. All this means more durability without weight which is the perfect combination for a down jacket—typically a fragile item. So how did they do it? By running the nylon between two heated rollers to flatten it and then forming a shingled fibre (or overlap). This calendaring process makes the nylon very tightly woven which is more windproof and lighter at the same time. When comparing 800 fill down to 650 fill you get the same warmth with far less weight and bulk which helps storage compaction. Combine this with sewn through construction (the stitch goes from the exterior of the jacket to the lining material) instead of box construction and you keep the weight down while keeping the down in place in a more cost effective manner. We all know that DWR's (durable water repellent finish) need to be reapplied as they wear out, well Mont-bell has developed the Polkatex DWR treatment. This DWR retains 90% of it's original water repellence after 100 washings. That is a long, long time - check back in 6 years to see if this one lives up to it's hype. Whats not to like about a down jacket that keeps you warmer that a typical ultra-light down jacket without much added weight and the ability to still pack it down to the size of standard water bottle. 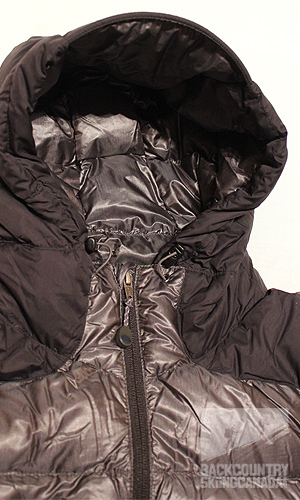 Mont-bell did a bang up job creating the Frost Smoke Parka as they thought about reinforcing the nylon shell with their "Ballistic Airlight" nylon and then beefing that up with a 40-denier fabric where it is required most. 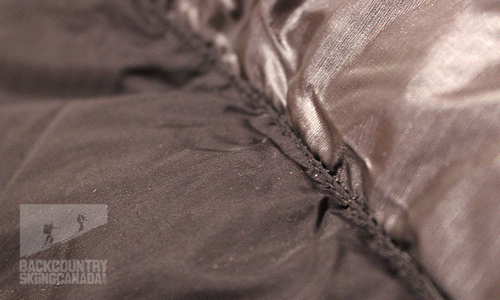 The 40-denier nylon would be a nice addition to the hemline as I find that these tend to wear out over time. The combination of the two nylon fabrics is not only practical but enhances the looks of the jacket and makes it more more appealing than those very common single fabric-single colour down jackets. 40-denier reinforcements on the cuffs, hood and shoulders to reduce wear, keeps the moisture out and generally give the jacket better aesthetics. I'm a big fan when a jacket comes with its own stuff sack as self stuff pockets are often too small and a great way to rip a zipper or puncture the outer shell of your downy. 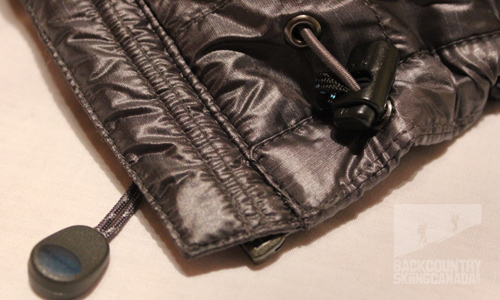 800 fill power goose down instead of 650 keeps you warmer while still being super compact and light. The price is also pretty easy on the pocket book compared to similar jackets on the market. 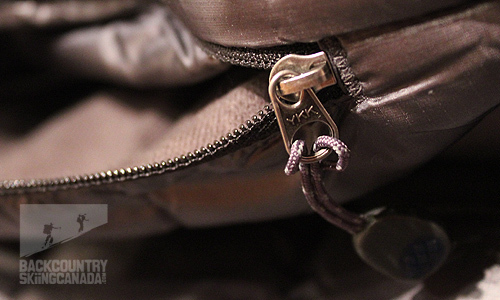 No internal pockets to keep the stuff sack handy while not in use. 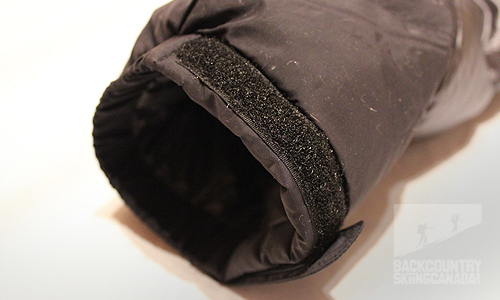 The two external pockets are only fleece lined on one side, both sides would provide extra warmth and comfort. I love this jacket. After a solid season wearing it on ski touring touring missions like the Wapta Traverse or multi week ski trips to Colorado this jacket continues to impress. It is pretty light and really compact but the best feature is the 40-denier nylon taffeta reinforcements on the shoulders, hood and arms. Keeps the shell from getting ripped by trees and keep the snow from melting through on the places it lands most. This is not a big-puffy jacket nor a light-puffy but something I would call a mid-puffy. Here in the interior of BC it is all I need for cold winters and even on trips to the rockies it is plenty warm. 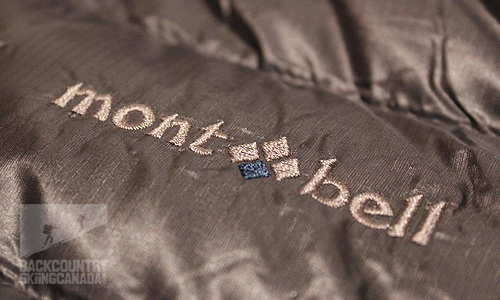 Mont-Bell knows their down and this jacket continues to keep me warm and happy.